is always a nice option to have if you anticipate ending up in a crowded room. on the outside of the doublet. The boning runs to just below the corset line. 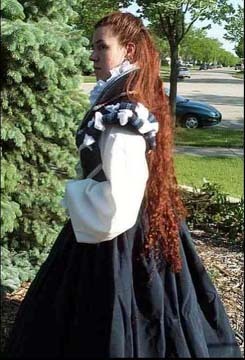 The doublet is shaped by a pair of curved seams at the side front and side back. 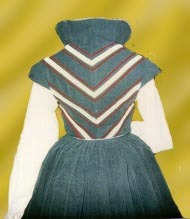 is there as a mounting for the double shoulder roll in the finished doublet. you sew. I don’t think I will do anything quite like this again! is just shy of 6 yards of fabric gathered down to the waistband. It is heavy. (Combination clothing and exercise equipment.) It drapes beautifully, though. I was happy with the end result. Beautiful! I’m interested in making a Spanish version. 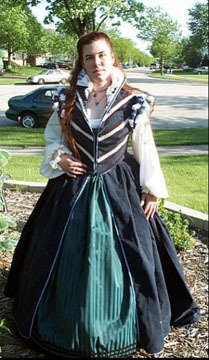 What are the differences you would make to make a Spanish doublet? Sorry it took me so long to get back to you. Italian and Spanish clothing from this era do have a lot of similarities, but they’re working towards different aesthetics. The Italians tend to emphasize the female form (paintings from the period show bodices with a remarkable amount of cleavage going on), add softness (skirts hang more naturally about the body, shoulder treatments and sleeves show a lot of soft poofs of chemise, etc), and emphasize width (especially along the neck line/dropped sleeve area). There’s a love of color, sometimes leaning towards garish. 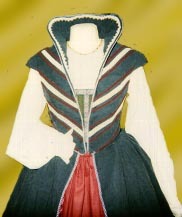 Spanish designs, on the other hand, are much stiffer and more prim – skirts are supported rigidly by the farthingale, decorations tend to be linear, the bosom is not worn so high and is thoroughly covered (either by a doublet, opaque partlet, or in the case of the Isabella de Valois (wife of Phillip II, portrait by Alonso Sanchez Coello, 1564, covered with a partlet of fine silk so heavily wrought and poofed that it might as well have been opaque – but she was a french princess), skirts have a visible tuck at the bottom (believed to ensure that the feet are covered when a woman sits). Overall, the aesthetic seems to emphasize a string vertical line right down the middle of the wearer, generally a fairly narrow color palate, and a general sense of stiffness. They’re little walking fortresses. Any help would be greatly appreciated – I’m quite comfortable with drafting things and figuring things out so long as I have /some/ idea of what I’m doing. Hi, Ysabel. In this case, the “rolls” aren’t entirely rolls at all. They’re two sets of loop tabs (long finished rectangles, folded in half, raw edges sewn in to the armscye). The tabs are sort of shingled over each other in two rows. Each row is stuffed with a little sort of crescent shaped pillow, and a looser bit of cotton to make the poofs. Thank you so much, this was very helpful to get some sort of idea of what I was doing. My shoulder rolls turned out great, now all I’ve got left is to make myself a hat! Everyone at the (non-SCA) event I was sewing for was quite impressed. I’m sorry I didn’t get back to you sooner – while the event itself went quite well, personal drama also ensued and has had me rather distracted the last couple weeks.